Hiking amongst fragrant flowers, enjoying an occasional snack of figs, grapes or blackberries, with a view of both the Alps and the coast. 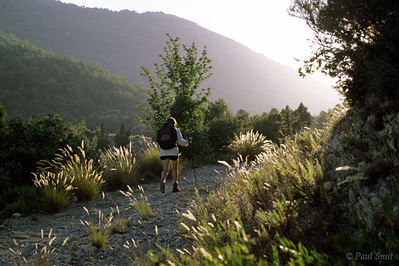 Experience the mountainous hinterland of Menton at the Côte d'Azur. Here you can read excerpts of this feature. A late summer sun sweeps over our trail near Sainte Agnès. Photo Paul Smit.